In the winter of 2003 (July here in the southern hemisphere) the Hazelnut orchard was planted - over seven hundred little trees. Included in the grand design was space through the middle for an avenue of thirteen rose-covered archways. Yippee! They're finally up! My two greatest garden loves are spiky plants and roses. I'm lucky to have country space for climbing pergola roses like Crepuscule, fence-monsters like The Mermaid, and washing-line hangers-on like Banksia Lutea. There are climbing Icebergs on summer fences, ramblers smothering my woodshed, and over three hundred smaller, more modest rose bushes scattered throughout the Moosey garden. 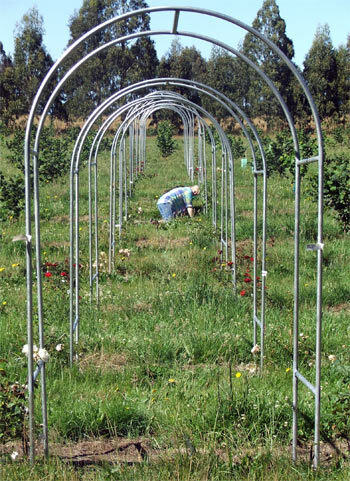 Now imagine a mature orchard full of Hazelnut trees, neatly mown grass between the rows, and an avenue of archways covered - no, dripping - with fragrant climbing roses! Such dreams can come true - all it takes is a plan, rose specifications (fragrant, healthy, maybe old fashioned), and a live-in welder - preferably one who can borrow an electric arc-welder from one of his country mates (thanks Peter). Then call it a birthday present, and hey presto! It's even free! 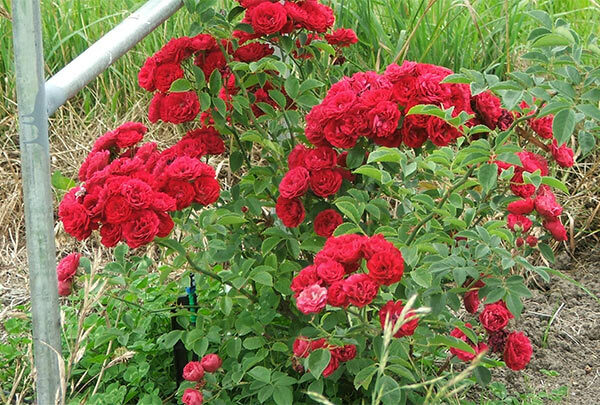 Quite quite easy, too - up they go, and in go the carefully chosen roses, each with its personal irrigation dripper. Then just wait for the summer sun and the fertile soil to work some country magic. I chose the roses from a Peter Beales rose catalogue (it had such good pictures). Size was limited to 4-5 meters, and the word 'fragrant' was compulsory. 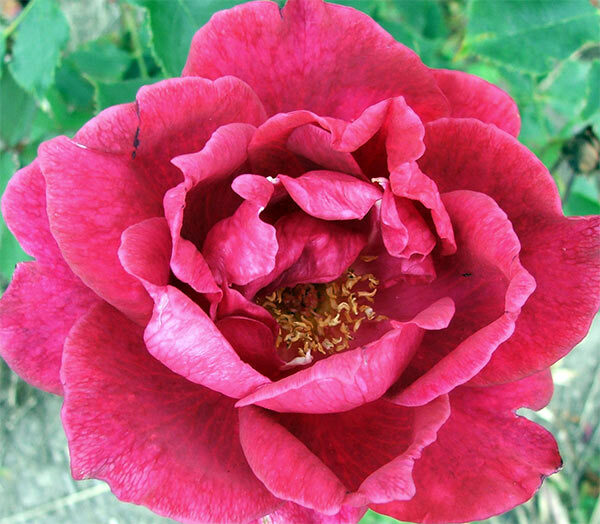 Old-fashioned, modern, once-flowering - nothing else mattered but fragrance. Then I made a mid-winter visit to a specialist rose nursery - followed by much anticipation waiting for the mail order arrival. Oops - there were just a few supermarket purchases, too - some compulsive rose rescuees from the sale table, like a pair of sad, bare-rooted Uetersens. I just know they will show their gratitude in the most beautiful, flowery way! Thirteen robust steel archways were built from lengths of galvanised steel 20mm (3/4 inch) water pipe, bent and welded in the Moosey garage. Then we carried them and stomped them into the ground, one by one. Thank you to Stephen for the archway design, and for spending many masked, 'sparky' mid-winter hours. The welder was too shy to allow photographs - unlike the 'weeder', pictured bottoms-up in the summer sunshine! The rose avenue has as yet not officially been 'opened', but all the roses are growing happily in their first summer, and are all flowering. Etoile de Hollande is absolutely beautiful, as is Gloire de Dijon. 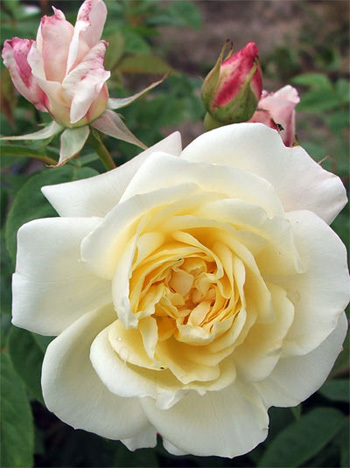 Eastlea's Golden Rambler has huge flowers, and the pale fluffies like Sombreuil and Phyllis Bide are going to be gorgeous. How exciting! It won't need many summers for each archway to become completely covered and my rose-dripping visions to become a reality! Gloire de Dijon, Ghislaine de Something-or-Other, Parkdirektor de Riggers, Eastlea's Golden Rambler, Souvenir de la Malmaison, Lady Hillingdon, Madame Caroline Testout, Chevy Chase, Uetersen, Etoile de Hollande, Celine Forestier, Meg, Phyllis Bide, and Sombrueil. There are many early details in the Moosey journal - including a photograph of the very first archway to be built, and the head gardener standing on the bare paddock - the perfect 'before' photograph for a garden project!